British Artist Anthony Burrill and Belgian creative agency Happiness Brusselsto have created a series of posters printed using the crude oil that was washed up on the beaches of Louisiana during BP’s Gulf of Mexico oil spill. 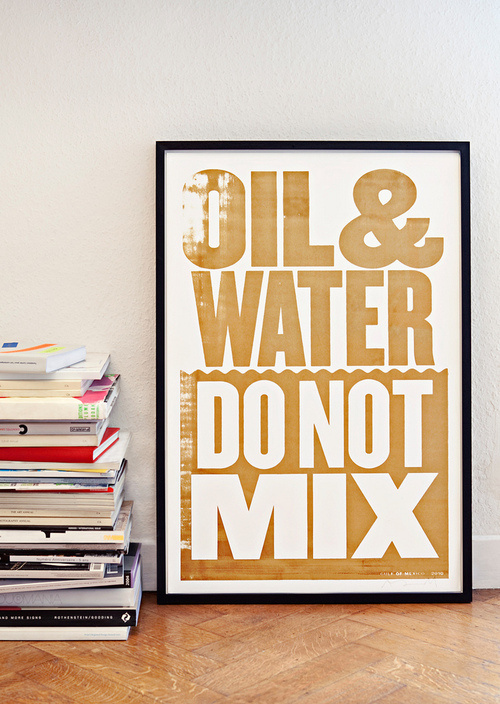 The words ‘Oil & Water’ are printed in a golden oil colour while below a stylised waterline, the oil-based paint is used to shape the words ‘Do Not Mix’ out of the neutral background of the poster. It’s a great concept and the execution of the posters is stunning. The posters will be available to buy, with profits going to the Coalition to Restore Coastal Louisiana.